Whatever success this blog has achieved in the last few years might be because candor has always had the upper hand. There’s no purpose in changing course now. The big question — maybe the biggest question in the history of Competitive Cyclist — is why did we agree to an acquisition by Backcountry.com? Since we owe nearly all of our success to you, our customers, I’ll endeavor to explain. Some background for starters. My first job in the bike business was with Pacific Bicycle, a retail chain in the Bay Area. It was the mid-90s and our industry was rudderless. There was no real innovation (no carbon, no concept of either aerodynamics or lightness, no suspension, no disc brakes.) 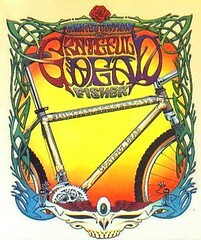 Substituting for true innovation were things like Grateful Dead-licensed Gary Fisher HooKooEKoos and Specialized’s purportedly exotic Metal Matrix frames. Business was perma-slow. The closest thing we had to excitement was doing a Jerky Boys routine when bewildered owners of Pacific Cycles (exclusive to Kmart, as I recall) phoned us for warranty or branded replacement parts. I worked at the Geary Street location and bristled under oppressive management. Memorably I was bitched out for eating lunch next to the cash register (‘…Disgusting!’ he called my sandwich). Termination loomed when a test ride turned into a bike theft. The cops told me later that the Driver’s License the perp gave me belonged to a dude who died a few weeks earlier. Employee-purchasing a bike was an administrative obstacle course akin to getting a passport. It didn’t help that, as an expensively educated young-20’s slacker fool of the era, I was certain of my special gifts, and infuriated by the world’s refusal to recognize them. My riding back then consisted of taking my Wicked Fat Chance from my Tenderloin apartment across the Golden Gate bridge, then up, down, and around the Marincello Trail and thereabouts. It had less to do with training than the pursuit of beauty. Few places are easier to admire on a bike than Marin, and it tied nicely with my passion at the time — a typical young-20’s slacker fool activity — writing short stories and poems in an attempt to make my own beautiful things. Around the corner from our store was Muriel Leff Park. Little Russian immigrant kids ran laps around the small plot of grass and played on the dinky slide. I’d slouch through my lunch hour on a park bench, stoking the fires of my literary pretensions courtesy of Franz Wright, Denis Johnson, Bin Ramke, and the rest. Their eloquence about urban existential emptiness sang to me like music. The chord they hit had a supreme resonance. Alas, I could never match their literary skills. Soon enough I left the job and fled home to Little Rock clinging to the suspicion that anger is the purest fuel for the creation of beauty. When we founded Competitive Cyclist just a few years later, it was with a clear commercial ethos in mind. Like the perfect one page poem we wanted a website that spoke in careful ways. Nothing on the Internet seemed more sumptuous than white space. Nothing was so rare as words that informed without puffery. No image told more than one which reveals the details of a lovely thing. ‘Content is King’ has been a cliché since those early days of the web. Yet it’s not wholly true. The right content is king. As a site and as a business our goal with Competitive Cyclist has always been to cultivate just that: The right content. Please understand one crucial thing: Our acquisition by Backcountry won’t diminish the quality of our content. Rather, our new situation means that we’re poised to achieve the opposite: We’re empowered to commit to content at a level we previously couldn’t imagine. We now have the backing in terms of capital, manpower, and capability to reach new levels of creativity in our copy, photography, video, editorial content, and user interfaces. Our fuel in the early days of Competitive Cyclist was anger indeed. Initially it was a quiet rage that came from too much ambition and not enough customers. After awhile we solved that problem. But a different rage has burned here ever since. It’s one that comes from our industry’s incessant demonization of the internet and the claim that our company (and others like it) spell the end of the brick and mortar retail. Underlying the acquisition is the business reality that the bike industry is on a collision course with the realities of online consumer spending. The amazing growth of companies like Specialized and Trek in the US comes from their single-minded focus on developing their dealer bases. For a decade they’ve pried away share from each other and from everyone else in a heavyweight slugfest. That process effectively neutered every other bike brand in America and created the notion that Trek and Specialized alone hold the future direction of American bike retail in their hands. Behind this is a secret you need to know: The US bike industry is not built around you, the consumer. Rather every program and every sales rep visit and every trade show conversation comes back to one question: ‘What’s in it for the dealer?’ Where this gets messy is when the conversation turns to the topic of the Internet. It’s clear that a best practice for modern commerce already exists. Look at America’s most beloved companies: Apple, Patagonia, Oakley, and Nike just to name a few. For them nothing is more important than customer convenience. As a result they offer their products through multiple sales channels: Consumer-direct online; online through third party retailers; consumer-direct through factory brick-and-mortar stores; and through third party brick-and-mortar retailers. Why so many sales channels? Because retail consumption can be a finicky thing. To deprive consumers of convenience and you deprive your brand of the lifeblood of revenue. But unlike those consumer goods titans, Specialized and Trek and the other big boys of bike only sell through 3rd party brick and mortar retail. Given that online channel is the only segment of American consumer retail showing significant and consistent growth, it seems inevitable that the bike industry must adapt. The dizzying growth of Competitive Cyclist is proof of the hunger of American consumers to buy online. Likewise, the numbers put up by newcomers RealCyclist.com and HuckNroll.com in less than three years proves the same. And who in the bike industry isn’t watching in trepidation at the impact of Wiggle and Chain Reaction with their carpet bombing approach to marketing and their cowboy approach to retail pricing? As an added data point, have you heard the anecdote that Amazon is the largest retailer of treadmills in North America? What happens when it moves onto bikes? This isn’t a zero-sum game of online vs. IBD’s. 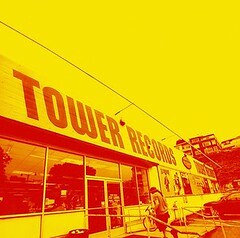 Put away your doomsday scenarios of shuttered record stores and travel agencies. No one debates whether online bike retailers are geared to do fittings. We know how hard it is to diagnose a bottom bracket tick over the phone and email isn’t great for coaching somebody through their first day on clipless pedals. Quality US brick and mortar retailers will thrive regardless of how the industry changes its approach to the internet. The cold, hard fact however is that the industry cannot avoid change. What Trek recently announced — in short, a program in which brick and mortar retailers serve as a fulfillment point for online bike sales — is just a variation of the program Cervelo couldn’t launch last year. Indeed, it’s the latest in a series of dead ends dating back to Specialized’s failed SDD program from the early 2000’s. Those efforts amounted to pulling the proverbial batteries out of the fire alarm rather than extinguishing the inferno. Consumer convenience cannot and should not be constrained to the touch point of an IBD’s storefront. Unlike the current essential structure of the bike industry, where dealer interests take priority over consumer convenience, our focus at Competitive Cyclist has always been on you. For those who asked if we sold out of financial desperation, the answer is a definitive ‘no.’ We sold out of a sense of aggression. If nothing else, 20 years of bike racing has honed my sense of timing for an all-in attack. The moment is perfect for us to fast-track our ultimate vision for Competitive Cyclist. We started this company with $10,000 and a bottle of Tums. It was a two-man, brick-and-mortar shop. We were a mere 1000 sq. ft, with one major marketing initiative — making sure the local racer dudes knew we kept some back issues of Penthouse in the shop’s rollaround tool case. Plenty has changed since then, but one thing never did. For 11 years we’ve been doing gymnastics on the razor’s edge of working capital. Accommodating huge growth while maintaining our standards devoured every extra penny we earned. Our vision is a capital-intensive, operational expertise-intensive, and manpower-intensive. Now that we’re together with Backcountry, we’ll ramp up our visibility through increasingly sophisticated marketing. We’ll grow our breadth and depth of inventory. We’ll develop house brands that deliver technology at unprecedented prices. We’ll stay obsessed with bettering the customer experience through service, content, and interactive tools. In doing so, we’ll achieve scale, influence, and success in every measurable form. It’s the American way to exploit and profit from market dysfunction. The time is now. Did Competitive Cyclist sell its soul? Lord no. We’ve done the opposite: We’ve saved our soul. How? The sorts of questions I formerly dreaded contemplating — ‘How do you automate a warehouse?’, ‘Is our accounting software obsolete?’, ‘Will an IT re-platforming crush our staff?’ — too often leached away our creativity. Because the operational competency of Backcountry is deep, we’re now liberated to channel our energies into areas you’ll actually notice. One example is our customer service team. While amazing and full of expertise, for too long they’ve drowned in overwhelming phone and email and chat traffic. We’ll soon be adding more CSR’s and we’ll train them to the level of product knowledge you’ve come to expect from us. Even better, we’ll be answering your calls over more hours every day and you can expect even quicker replies to your emails. 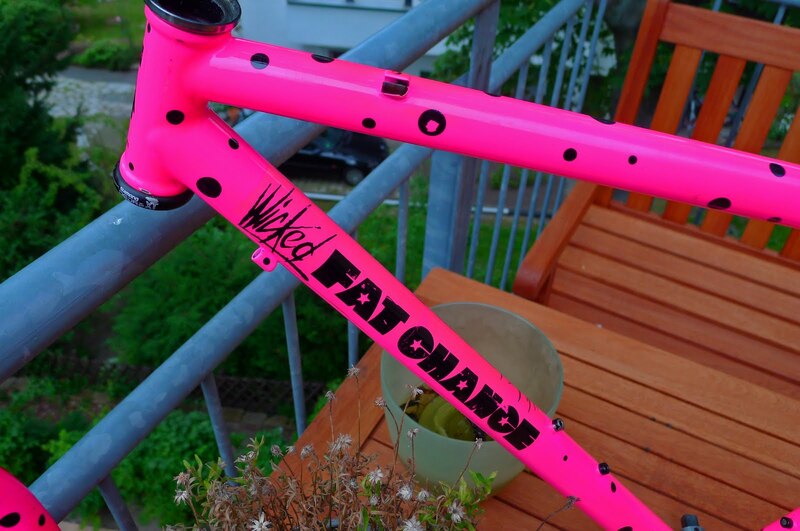 Another change is how quickly we’ll get your bike, frameset, and wheelset orders out the door. Just like our CSRs, we’ll invest in Service Department staff so that even in peak season you won’t have to wait more than a day for labor-intensive items to ship. We’re currently building a new bike assembly facility in Salt Lake City that will give our Service Department the space it needs now and the scalability it needs for the future. For those of you who’ve visited our current facility in Arkansas, imagine that shop, but re-built from scratch with the benefit of countless lessons learned. We’ll achieve new levels of efficiency and precision without sacrificing quality control or our apeUPS-proof packaging. And, lastly, nothing is closer to the heart of Competitive Cyclist than an appreciation of all things PRO. Pinning on a number is the almighty act of PROness, so we’ve decided that for 2012 we’ll bring our commitment to the racing scene to an entirely new level. Expect big news on this at Interbike. What does this mean to Merlin? Easy answer: It means we’ll finally have the bandwidth to devote to it. We’ve taken some important behind-the-scenes steps in preparing for its re-entry to the market over the last few months. The challenge, though, was that everyone involved in Merlin was also a Competitive Cyclist jack-of-all-trades. For too long we’ve been an organization strong on utility infielders. We now have the luxury of specialization. I’ll be racing the local spring classics in 2012 on a Merlin, and with the plan we’re putting into place, you’ll be able to do the same. What does this mean to Canyon? We’re freshly back from Eurobike. A highlight was our meeting with Canyon. 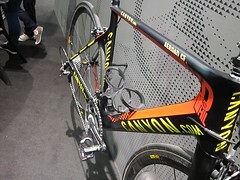 The short answer is that Canyon frames are coming, and Competitive Cyclist will be your exclusive US source. We’re finalizing our announcement of the timetable. (We forgot to ask them if we can disclose dates. Sorry, tradeshows have a way of making me absurdly absentminded.) Admittedly, the timeframe won’t be as speedy as we’d like, but it’s for good reason: Thanks to relentless praise in the media for Canyon and a Hall of Fame season by Philippe Gilbert, the European demand for Canyon is outstripping supply. Europe is the key market for Canyon, and it’s unwise to debut it here with just a trickle of bikes. While it may be painful, patience must rule the day. What about your people? Are they moving to Utah? We’ve offered positions in Utah to as many people as was feasible. In terms of the people you know — our CSR’s, our mechanics, our merchandizing people — nearly all of them have been offered the opportunity to relocate and they have until mid-September to make their decisions. Needless to say, modern American adult life is a mightily complex thing. Not everyone who wants to make the move can do so. As it stands now, we’re optimistic that as many as 35-40 people will go to Utah. Competitive Cyclist has the largest and strongest team in high-end bike retail. It’s something we’ve taken great pains to cultivate, and it’s something we’ll protect. Priority #1 for us is maintaining continuity in the customer experience at Competitive Cyclist, and that means we’re doing our best to keep our staff as intact as possible. What’s the timetable for the move? Our last day of operations in Arkansas will be October 14. We will re-open in Utah on October 17. Our email addresses and phone numbers will stay the same, so the transition should be headache-free from a customer perspective. What happens to Backcountry’s bike websites? Nothing will change. RealCyclist.com and HuckNroll.com both have sizable customer bases, and they deserve the same continuity we’re working so hard to ensure for customers of Competitive Cyclist. Backcountry’s ODAT bike sites Bonktown.com and Chainlove.com are wildly popular, so you’ll see no changes there either. It was in drunken ecstasy one night in 1990 that I watched Nirvana on their Bleach tour with a total of maybe 40 people. I remember the agony of Nevermind a few years later. Even if it was only in a symbolic way, it was Corporate Rock, and it broke my heart. I’ll never forget it, and that’s probably why I can’t bear to type this is not a sell out. Words are always empty things. For the last 11 years we’ve delivered with deeds, and that won’t change one bit. What’s coming is a smarter, bigger, more operationally-sound Competitive Cyclist. No one will benefit more than our customers, and we’ll prove it every day.